If the name Randal Pinkett sounds familiar, it may be because Pinkett was the first African-American winner on "The Apprentice." When he won, this black man also became the only contestant to be asked to share his victory--with a white woman. The request (and Pinkett's subsequent refusal) set off a firestorm of controversy that inevitably focused on the issue of race in the American workplace and in society. For generations, African-Americans have been told that to succeed, they need to work twice as hard as everyone else. But as millions of black Americans were reminded by Pinkett's experience, sometimes hard work is not enough. "Black Faces in White Places" is about "the game"--that is, the competitive world in which we all live and work. The book offers 10 revolutionary strategies for playing, mastering, and changing the game for the current generation, while undertaking a wholesale redefinition of the rules for those who will follow. It is not only about shattering the old "glass ceiling," but also about examining the four dimensions of the contemporary black experience: identity, society, meritocracy, and opportunity. Ultimately, it is about changing the very concept of success itself. 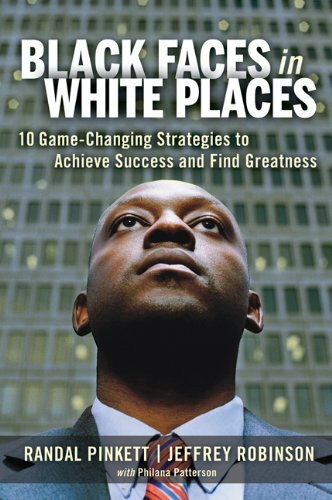 Based on the authors' considerable experiences in business, in the public eye, and in the minority, the book shows how African-American professionals can (and must) think and act both Entrepreneurially and "Intrapreneurially," combine their collective strengths with the wisdom of others, and plant the seeds of a positive and lasting legacy.